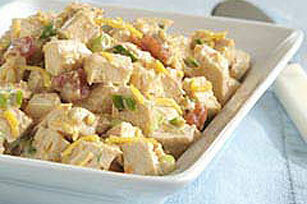 Kick up your chicken salad—easily—by adding shredded cheddar and ready-made, chunky salsa to the mix. You can serve with warm tortillas. Mix all ingredients except tortillas. Cover. Refrigerate several hours or until chilled. Save 60 calories and 7 grams of fat per serving by preparing with KRAFT 2% Milk Finely Shredded Reduced Fat Cheddar Cheese and KRAFT Light Mayo Reduced Fat Mayonnaise. Substitute 2 pkg. (6 oz. each) OSCAR MAYER CARVING BOARD Flame Grilled Chicken Breast Strips, chopped, for the cooked chicken.